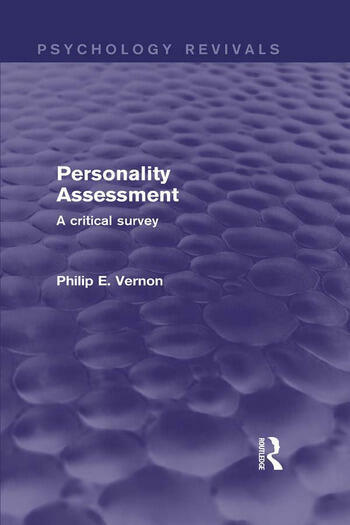 Originally published in 1964, the aim of this book was to analyse the psychological processes involved in understanding personality, and to consider how the psychologist could help in making more accurate assessments. Professor Vernon discusses in detail the scientific status of psychoanalytic and other ‘depth’ theories of motivation, the value of different types of psychotherapeutic treatment and counselling, the influence of upbringing on the development of personality, and the effectiveness of projective techniques. He also examines the reasons for the highly variable results obtained with personality tests and questionnaires. As well as providing a balanced review of theories of personality and of various types of test, this work made a fresh contribution to developing improved techniques of assessment. Foreword. 1 Introduction and General Summary Part 1. Naïve Interpretations of Personality 2 Perceptions and Misperceptions of People 3 Theoretical Considerations 4 Experimental Investigations of Personality Judgments Part 2. The Clinical Psychologist’s Understanding of Personality 5 Reliability and Validity of Depth-Psychological Interpretations 6 Fundamental Concepts of Depth Psychology 7 Self-Theories as an Alternative Approach to Explaining Personal Behaviour 8 The Effectiveness of Psychotherapy and Counselling 9 The Scientific Status of Clinical Methods and Depth Psychology 10 Projective Techniques Part 3. Objective Approaches to Personality 11 Measurement of Traits and Factors 12 Test-taking Attitudes and Spurious Factors 13 The Concept of Validity, and Other Technical Considerations 14 The Personality System Part 4. Practicable Methods of Assessment 15 Tests and Observations of Behaviour 16 Self-Report Tests 17 The Study of Personal Concepts. Bibliography. Subject Index. Author Index.